Vacation rental cottage. Sleeps 2, 0 bedroom, 1 bathroom. Dogs allowed. Relax with a nice dip in the spa & a glass of wine. Cute kitchenette that provides the essentials for the inner chef. The country decor gives a rustic yet fashionable vibe. View of bedroom area, kitchenette and dining area. Comfy queen bed perfect for two. Outdoor seating on the grounds. This country cottage used to be part of a dairy farm in the 1920s. Exterior of the home. fenced in yard. Welcome to Idyllwild Dairy Cottage and Farm. Fenced in yard, perfect for bringing pets. Mini museum with relics from when the property was a dairy farm. Welcome to Idyllwild Dairy Cottage! This charming cottage is the perfect place for a romantic weekend getaway with a loved one or even alone! When you walk into the property you will fall in love with the home’s country charm. The cottage is beautifully and meticulously decorated to give an appealing ambiance as well as celebrating the property’s long history as a dairy farm. The cottage is set up like a studio, but is not lacking any necessities! The kitchenette has everything you could need to whip up a meal and includes but is not limited to a microwave, hot plate, coffee maker, mini-fridge, utensils. There is also a dining table set for two. The bed is a queen-sized bed and is very comfortable. 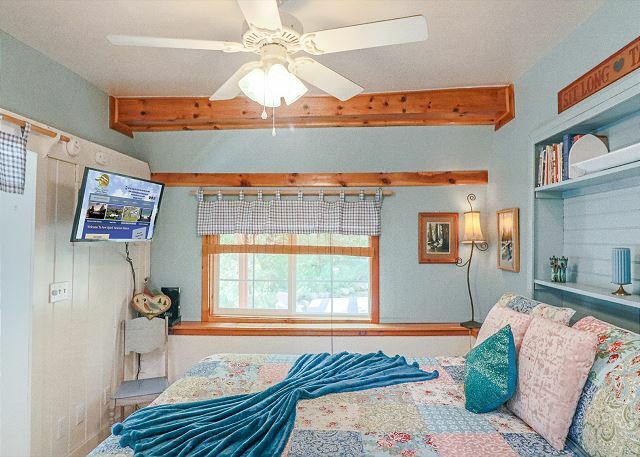 The home does have wi-fi and a television set up so you can still stay connected. The bathroom has a walk-in shower as well as a skylight so you can get views of the beautiful clear blue sky. The yard is fenced-in, so your furry friend can run around and enjoy the property as much as you are! 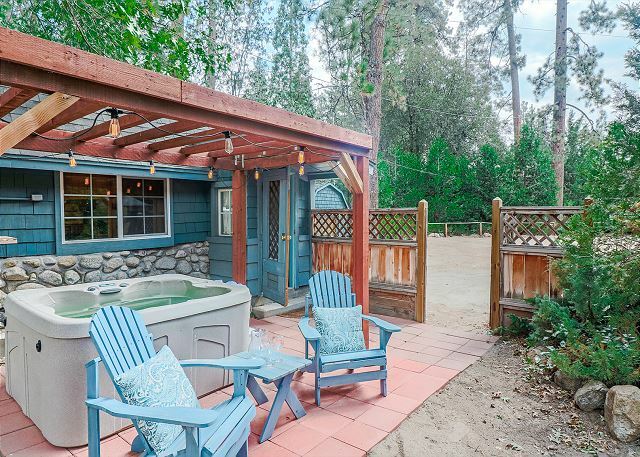 The property also has a hot tub, which is great to use throughout all the seasons. The property is located on a historical Dairy Farm that was built in the late 1920s. The property is only a few blocks from town. Why take the car when you can take a nice scenic 5-7 minute walk amongst the tall pines. 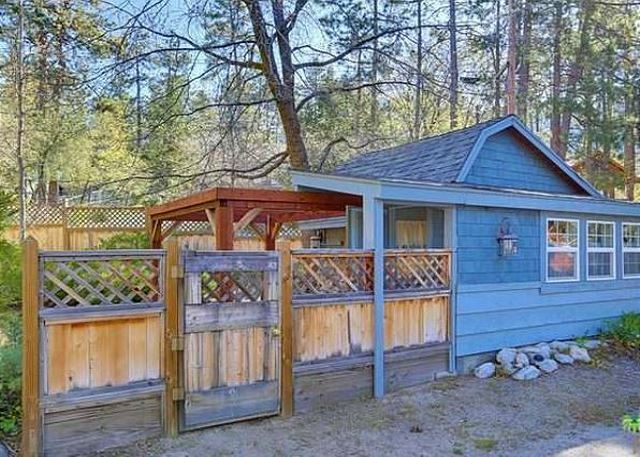 Idyllwild Dairy Cottage has it all: charm, romance, amenities, location, significance. 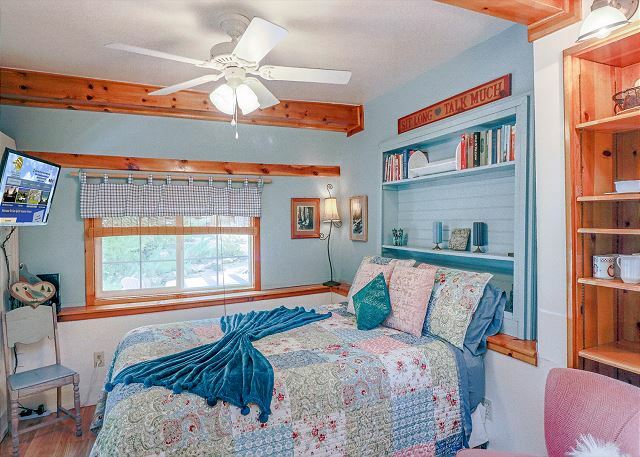 Book today and take a weekend vacation in this delightful cottage. Weekend rate Friday/Saturday is $140.00 p/night. Weekday rate Sunday thru Thursday is $125.00 p/night. Winter Holiday rate $200.00 p/night (Thanksgiving, Christmas & New Year's Eve), with a 4 night minimum. Holiday rate $175.00 p/night, a 3 day minimum may be required. Call us for our weekly/monthly specials. Pets are welcome. Pet fee will apply. Linen/Prep fee $60.00. A lovely Cottage, great Jacuzzi. I think one needs to check if they've put more secure fencing on the one side. I really,really liked the cottage! There is no oven, just a two-burner stovetop. This was not a problem. Perfect for two people! No cows at the Dairy Cottage, just lots of peace and quiet! This little cottage was the PERFECT one-person-plus-dog getaway destination. We came up from LA for the 4th of July week to escape from the fireworks mayhem in the city, and I'm happy to say the loudest noise we heard the whole time was the tree frogs. 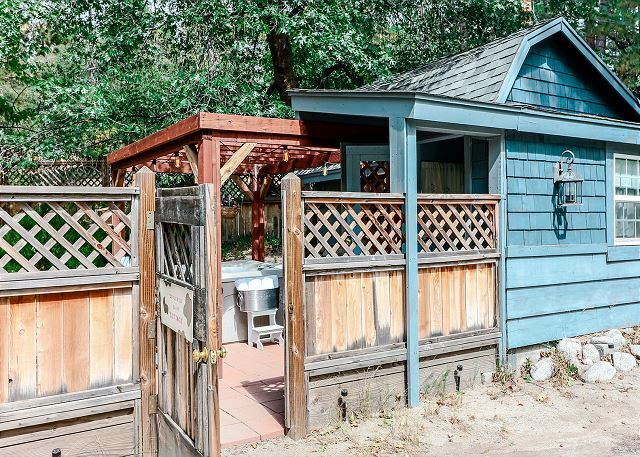 This is a sweet little cottage, with all the amenities that were promised: total privacy, comfy bed, TV (once I figured out how to use it), good wifi, nice kitchen and bathroom, enough space to spread out a bit, a fine hot tub, and best of all, a private fenced yard for the dog to run around in. We hiked a little, went to town for coffee and groceries, and I had a wonderful massage down the road. I'm so happy to have found this little haven of peace and quiet. We had a nice stay in this cottage. It is not secluded, so if that is what you are looking for, this is not the place. Property is small but not tiny. It will be OK for a couple and feels very cozy. The private backyard isn't much, but the spa is spectacular, especially at night. The property is in a shared area with another house, so parking might be tricky if the other house has more than a couple vehicles. Just a few minutes walk from the main town area and great for star gazing or just generally relaxing. The Dairy Cottage was just right for a couple of nights. 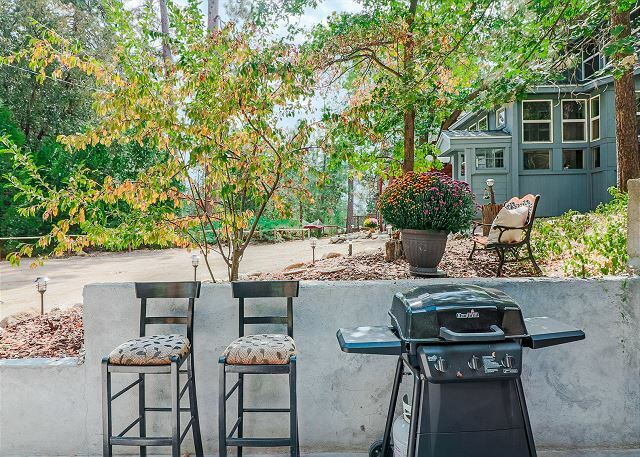 Very quiet and your own nice little secluded yard. The cottage is small but homey and comfortable. We did find the bed a bit too soft for us, but that's personal taste. We were very impressed with the fact that New Spirit is a non-profit giving opportunities to those who don't get lots of those; we'd never come across a property management operating that way and thought it a great idea. It was helpful that a notebook explaining New Spirit was left out in the cottage as there ad been a small element of missed communication, but nothing that mattered. And when we learned we were working with people who may be new or not completely trained, it all made sense. Great location. Walking distance to town, yet tucked away in it's own neighborhood. 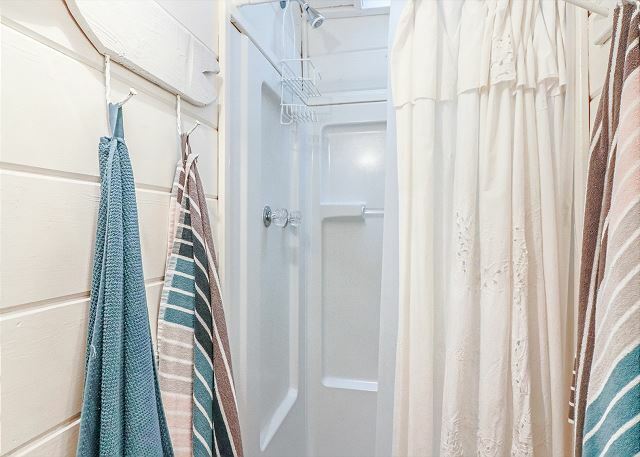 Is a perfect vacation rental super clean and comfortable ??? ?